When you are on a cruise, crime is usually the furthest thing from your mind. Unfortunately, that attitude can make for easy pickings by criminals both on the ship and in ports of call. To be absolutely clear, the chances of you being a victim of theft — or any crime — while on a cruise ship is relatively low. It’s fair to say you run about the same risk as you would walking around back home. However, things to happen. 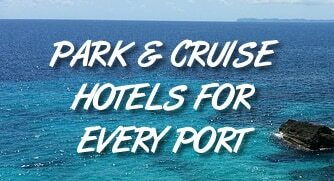 In particular, petty crime in cruise ports is fairly common. From pickpocketing to snagging an unattended purse or camera bag, stories about of tourists becoming victims. The truth is, when there are thousands of cruise ship passengers in a sunny port, some people let their guard down. And when you make it easy for a criminal to make a score, it increases your chances of having something stolen. The good news is that an ounce of prevention can be worth a pound of cure. By making it just a little more difficult to steal something you own, your odds of being a victim plummet. With that in mind, we rounded up a list of items that can help prevent theft on your next cruise. Are you familiar with RFID? It stand for radio frequency identification. In layman’s terms, it’s a small chip embedded in many credit cards and even passports that allow stored information about the card or document to be shared without scanning. While it speeds things up at checkout, it’s also vulnerable to theft without you even realizing it. Someone with a scanner only has to stand near you to grab things like your credit card number. To be sure, the risks of RFID low, still many items offer RFID blocking. We’d rather have that peace of mind than not.